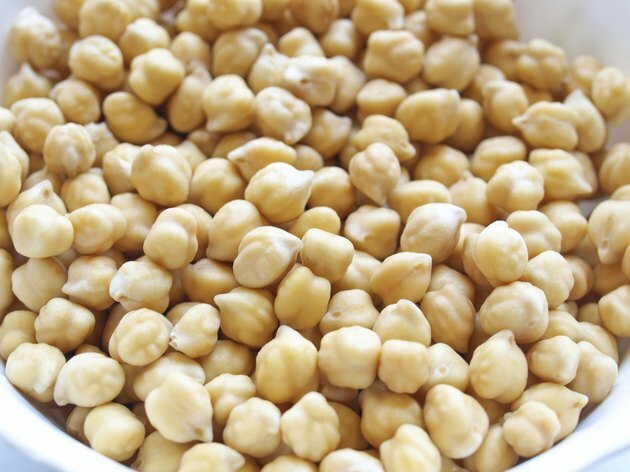 Chickpeas, a highly popular pulse used in Indian and North African cuisine, come dried or in cans. Canned chickpeas don't take long to prepare and cook. Dried chickpeas require soaking before use. Cooked chickpeas add bulk and protein to many tomato-based or curry-style dishes. Chickpeas also make up the main part of the popular dip, hummus. Chickpeas contain approximately 20 percent protein and 55 percent carbohydrate. Added directly to a curry, soup or stew, chickpeas cook in the liquid along with the rest of the vegetables and meat. Add a cup of chickpeas to a pan. Sift through the dried chickpeas with your hand and pick out any bits of husk, debris or broken chickpeas. Pour 3 cups of water on top of the chickpeas. Cover and leave overnight -- or for at least six hours prior to cooking. Drain the soaked chickpeas in a colander and rinse the chickpeas. Put the chickpeas into a metal pan. Add water until it covers all of the chickpeas. Bring the water to the boil. Lower the heat and let the water simmer very gently for one hour. Test for tenderness and season to taste. Drain the canned chickpeas over the sink. Rinse the chickpeas thoroughly under a strong running tap. Pour the contents into a pan. Cover lightly with water and heat for five minutes. Alternatively, add straight in to stews, soups or fried dishes. Drain the boiled chickpeas and serve or add to your dish. Fry onions and garlic in a little oil then add canned or cooked dried chickpeas to create a tasty snack. Always rinse canned chickpeas before cooking. The water inside often tastes slimy and unpleasant.